The market freakout of 2016 keeps getting scarier. Cheap oil and China remain the major culprits. The Dow dropped another 391 points on Friday, leaving the index down an incredible 1,437 points in just the first two weeks of the year. The S&P 500 lost 2.3% and the Nasdaq plunged 2.7% to its lowest level since October 2014. The wave of selling dashes hopes that Wall Street's panic attack was over. The Dow had jumped 228 points on Thursday, its best day since early December. "The sentiment is dominated by fear. Ahead of a long weekend, no one wants to be exposed," said Sam Stovall, managing director of U.S. equity strategy at S&P Capital IQ. Friday's market slide was fueled by another crash in crude oil prices and China's stock market tumbling into a bear market. The U.S. stock market descended into some scary territory as well, with the S&P 500 briefly breaking below its August 24 low before rebounding above it. "There's a mad rush for the exits! There is one direction to this trade in the immediate term: Lower," said Peter Kenny, an independent market strategist and founder of Kenny's Commentary. Even the White House weighed in on the recent market turmoil. 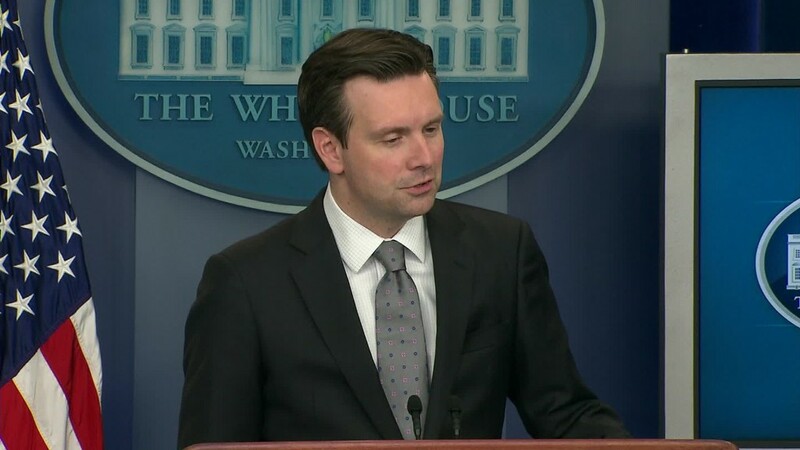 White House spokesman Josh Earnest said on Friday officials are closely watching market movements and their potential impact on the U.S. economy. Stocks have moved almost in lockstep with the price of oil, which plunged another 6% on Friday to as low as $29.28 a barrel. That's the cheapest it's been since late 2003. Friday's plunge was fueled by signs that sanctions on Iran could be lifted as soon as this weekend, exacerbating the supply glut rocking the oil market. While the oil plunge is great for many consumers because it lowers the price of gas at the pump, it's been a big negative for stocks lately. First, cheap oil eats into already-shrinking profits for energy companies. Many of the biggest losers on the S&P 500 on Friday were energy stocks, with Marathon Oil (MRO) and Consol Energy (CNX) plummeting 10% or more. 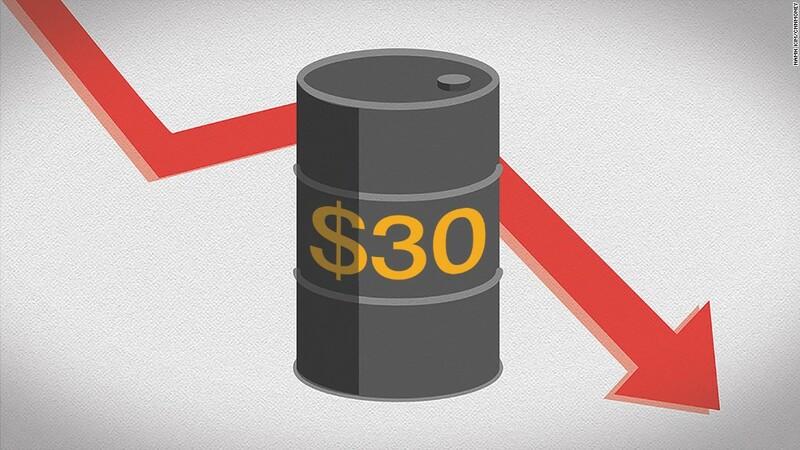 Secondly, the oil crash is raising fears that poor economic performance around the world is sapping demand. After all, oil demand is seen as a strong indicator of growth. "Oil needs to stabilize. It seems misguided to conclude that equity prices will reverse course and trend upwards when the price of crude continues to trend lower," said Terry Sandven, chief equity strategist at U.S. Bank Wealth Management. Also, it's not clear consumers are really spending their gas savings at the stores. The government said on Friday that U.S. retail sales dipped in the critical month of December. That's never good. Economic concerns were reinforced by a new gauge on New York-area manufacturing activity, which unexpectedly plunged in January. Meanwhile, shares of Intel (INTC), one of the blue chips of the tech world, plunged 9% as the slowdown in PC demand dented profits more than feared. Wall Street continues to take its cues from China, where the Shanghai Composite plunged another 3.6% on Friday. That leaves the benchmark index more than 20% below its December high and in a bear market. China's stock market has been rocked by the slowdown in the country's economy and Beijing's failed efforts to stabilize financial markets. The turbulence has eroded confidence on Wall Street that Chinese authorities have a firm grip on the situation. U.S.-listed Chinese companies took another big hit. Alibaba (BABA) and JD.com (JD) tumbled 4% apiece, while Weibo (WB) plunged 5%. Signs of fear in financial markets are present everywhere. On Friday the 10-year Treasury yield briefly slipped below the 2% level for the first time since October. That doesn't happen when things are going well. Gold, which tends to rise when people are scared, popped 1.4% and to $1,088 an ounce on Friday. 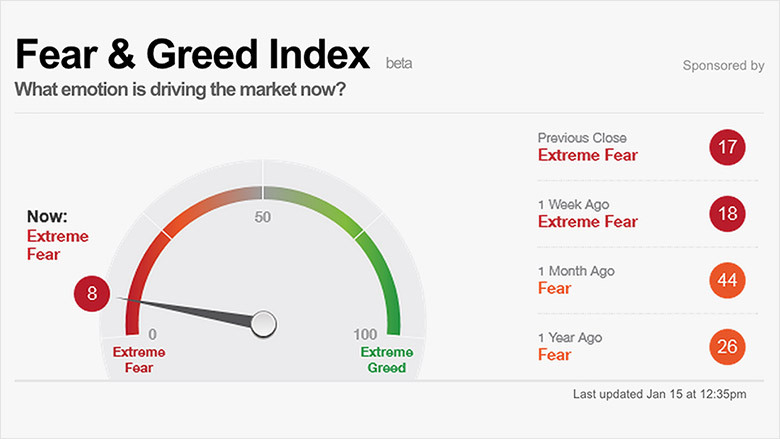 CNNMoney's Fear & Greed Index, which tracks several indicators to measure market sentiment, continues to flash "extreme fear" and is back in single digits for the first time since the August freakout. Is this the big 'capitulation day'? The latest big losses in stocks have some wondering whether Friday could mark a so-called "capitulation day." Those scary down days occur when investors give up on the markets and can be a sign of a bottom in prices. "We need a big shakeout to shake off the loose hands. Today might be that day," said Stovall, adding that it could mean the end of the declines is near. Investors should be happy that the S&P 500 managed to close above its August low of 1,867.01 after briefly tumbling below that key level. "That might be an important sign that those lows have become permanent and the market is unwilling to push it below that," said Mark Luschini, chief investment strategist at Janney Capital.